PRODUCT: 2-3/8 in. x .113 in. 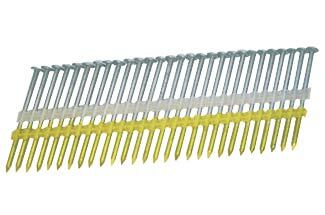 Electro Galvanized, Ring Shank, 8D 20-22 Degree Plastic Collated, Full Round Head Nail. 5000/Box. Price/Box. DESCRIPTION: The Steelhead STD8D113REG Ring Shank Nails are Electro-Galvanized for rust protection and specially formulated for interior and exterior house framing.